When it comes to owning any type of business, having a website is very important. These days, people take to the Internet first to do research and find businesses to work with. 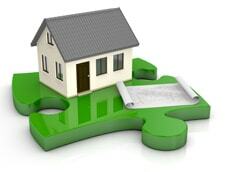 Especially for real estate agents, having a functional website is absolutely essential. If you know how to develop a website, then congratulations, you are already well ahead of the curve! If not, don’t fret – there are ways to build a website with little to no knowledge of web development. The best way to quickly and easily build a website is to use a service called WordPress. Basically, WordPress allows you to build a great looking website from a simple to use control panel. From there, you can add on themes, which change the appearance of the website, and plug-ins, which add to the functionality of the site. While most businesses can benefit from having a website, certain industries will benefit much more than others. For example, real estate agents almost always have websites. This is because people want to browse through real estate listings at their own pace, in the comfort of their own home. If you are a realtor and have yet to build a website, you owe it to your business to get it done as soon as possible. Unless you want to hire-out the work, you should start with a nice WordPress real estate theme, such as HomeQuest, a brand new theme from developer ThemeFuse. ThemeFuse is one of the developers we work hand-in-hand with. They are an excellent WordPress development company that has been around for about 2 1/2 years. They know the ins-and-outs of WordPress theme development, and have a staff of 12 skilled employees that can help with any technical issues you might run into. With a huge selection of ready-made themes, which are updated regularly as WordPress itself receives updates, it’s no surprise that ThemeFuse is such a popular company. HomeQuest is, by far, one of the best real estate themes for WordPress on the market today. Combining an array of useful features, HomeQuest makes building an extremely professional website an easy task. Once built, all your potential clients will have a place to go to browse the homes you have available. This helps in two ways. First, it proves to your clients that you are a professional and ahead of the curve, which will inspire confidence. Second, it allows clients to see pictures, read descriptions, and even comment on particular available properties. Listing all the information in one place is great, because it allows clients to do their own research regarding the surrounding area, schools, shops, etc., which saves a lot of time for everyone involved. So why should you choose this WordPress realtor theme? What makes it better than the other themes available? The short answer is that HomeQuest provides much more features than competing themes. Below is an overview of some of the front and backend features that this theme offers. “Frontend” refers to the features available to clients browsing your site, while “backend” refers to the features on the control panel of your website, which you will use to create and edit your site. All these frontend features are edited from the backend, so there is no need to explain their functionality twice. There are a lot of real estate themes for WordPress to choose from, but HomeQuest boasts the best design. It is simple, clean, and efficient, but also beautiful. 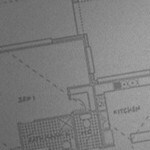 The background for the header is a silhouette of floor plans, adding to the real-estate theme. Even when the site is filled with listings and blog posts, the homepage is still simple and uncluttered. As soon as you see the demo of HomeQuest, you will be awed. It’s simple yet elegant design is amazingly beautiful, and its features are very useful. The front-and-center of this WordPress real estate theme is a “featured homes” slideshow. This can display a large number of pictures, which automatically change every 5 seconds or so (the time between pictures can be changed through the backend control panel). You can use this slideshow to show off your most attractive looking homes, to help capture the attention of potential clients. Beneath each picture, you can add information, such as location, number of bedrooms/bathrooms, and asking price. This information changes along with the slideshow, allowing you to display a lot of information all in one place, leaving your site simple and uncluttered. Directly to the right of the slideshow is a custom-built search engine. Users of your site can choose from a variety of options to focus in on the types of homes they are interested in. Clients can choose a location from a drop-down menu, and select whether they want to rent or buy. Next, they can choose the number of bedrooms and bathrooms they want, also from a drop-down menu. Lastly, a nifty sliding scale allows clients to select the price range they want, anywhere from $0 to $3 million. 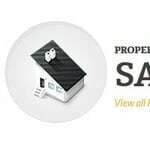 Below the search engine and slideshow, you will find a list of recently added properties. This section will be very useful for people who check back on your site regularly. 4-5 properties can be listed here, and you can choose to have them update automatically when you make a new listing, or you can choose to manually edit them. Each listing will have a thumbnail picture of the property, followed by basic information such as property type, asking price, number of rooms, and location. The next item down on the page, under the latest added properties, are a few clickable icons asking the user what type of property they are looking for. The categories are set to the default of properties for sale, apartments for rent, and office space for lease, although these categories can be changed. These icons allow users to browse through listings without searching for anything specific. The last thing on the page will be your blog. This is optional, but highly recommended. Having a blog draws readers in from all over the web, especially if you know how to optimize your blog posts for the search engines. 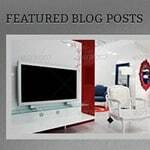 Try to update your blog regularly with useful, keyword-rich posts. To the right of the blog posts will be a “latest discussions” box, which will display the most recent comments left on your blog posts. You can set filters and/or manually edit these comments to weed out spam and other unwanted posts. For those familiar with the inner workings of WordPress, using the backend of this theme will be a breeze. For those new to WordPress, there is a slight learning curve, but it is still MUCH easier than developing a website from scratch. Most of the features available on the backend of this theme are just the everyday features available to any WordPress-powered website. There are, however, a few features that are unique to this WordPress realtor theme. The default color scheme for HomeQuest is grey/white, but there are several other options available. 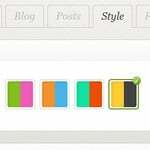 From your WordPress backend, click on HomeQuest > Style > Color scheme, and pick from green/pink, orange/blue, turquoise/red, or yellow/black. It is very easy to try out a scheme and then change it back to the original colors, so don’t be afraid to try out any particular color scheme. 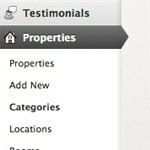 Like most real estate themes for WordPress, HomeQuest allows you to edit the details of each property you list, and choose which details to add or leave out. You can stick to the basics – location, asking price, number of rooms, etc. or you can add much more detail, such as flooring, fireplace, lot size, zoning, and much more. You can also choose what order you want to put this information in. The developers of HomeQuest realize that real estate agents have to be very flexible in the type of properties they offer, in order to complete the most sales. 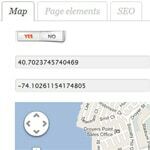 Because of this, they implemented the ability to add property categories to your site. You can add as many as you want, and implement a search-engine friendly tag to each category, which will help draw in readers from the Internet. Once a category is selected, the reader can choose from everything listed in that category. Once you have all your categories laid out, you can begin to list specifics for your properties. Almost everything is editable, including locations, rooms, amenities, styles, Google Maps position and features. You can also choose to list the agent that is showing the property. You can even include sub-categories, such as a “New York City” category with a “Bronx” sub-category. The standard license of HomeQuest is a single site license priced at $95 and comes without layered PSD files. The developer license is priced at $145 and can be used on multiple sites, this license comes with layered PSD files. Click the THEME DEMO button below to see a live preview of the HomeQuest theme where you will be able to browse through all pages, or click the MORE INFO button to read more or to buy the HomeQuest theme. We are happy to offer our readers a free ThemeFuse discount code! Grab it and use it for club membership or for purchasing any ThemeFuse theme, no matter if it’s standard or developer license. You will get a great deal with an exclusive $10 discount! We can say ThemeFuse has released yet another functional, sensationally good looking theme. If you are running a business that is real estate related in any way, HomeQuest will be the best choice for your website theme. It is simple to install, very easy to operate, and the most important thing about it – it is 100% original, and it looks exceptionally good. The layout is very elegant and it will make your site look highly attractive. Aside for looking pretty, this theme will allow your visitors and potential customers to easily find their way through the website. You will be given the option to customize this theme in various ways, adapt it to your liking and by doing so, making it absolutely unique. HomeQuest is, without a doubt, a perfect WordPress theme for Real estate websites. The theme was specially designed for sites of this kind. HomeQuest is the theme that represents your website in the best way possible. giveaway: 3 premium WordPress themes from ThemeFuse! Nothing gets your day started quite like free stuff. We at WPdiscounts love it, which is why we are proud to offer our first giveaway! In this HomeQuest review we have the privilege to giveaway three premium WordPress themes from ThemeFuse (thank you guys!) for some of our lucky readers, you can choose yourself which theme you want, HomeQuest or another theme (standard license). This giveaway is hosted on RaffleCopter, enter your name and email, then do the following tasks to get more chances to win. The winners will be chosen randomly by the system in 10 days time. Just a small note: you don’t have to do each thing, but you will receive entry point(s) for each task you complete – the more points you get, the higher chance you can win ! Help us by tweeting and sharing this giveaway, so that more people will know and have a chance to win a great WordPress theme. If you haven’t visit Themefuse’s gallery yet, I suggest checking it here to see how awesome their premium WordPress themes are and what themes you can choose if you win this contest. All winners are mailed, and keep informed about our future giveaways by subscribing to our newsletter! My fave is the “Writer” theme. It’s classy and not too busy and distracting. I love the Freshfolio theme! It would be great for showcasing beautiful photos with a minimalist feel.